The launch onto the market of the idyllic north Cotswold hamlet and estate of Little Rollright, in Oxfordshire, three miles from Chipping Norton and five miles from Daylesford Farm Shop-at a guide price of £18 million through Savills (020-7409 8809) and Simmons & Sons (01491 634299)- has so far elicited a measured response from the UK and Europe’s property-seeking elite, selling agent Giles Lawton of Savills reveals. 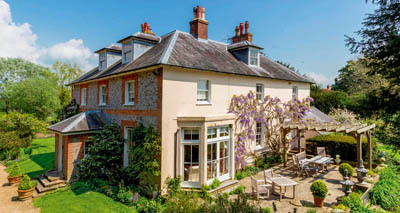 Nobody wears his wallet on his sleeve these days, but the recent rush to ‘best and final offers’ on a number of traditional working estates suggests that the lure of English farmland, with its enduring tax appeal, remains as strong as ever. Yet, even for the man who has everything, a once-in-a-lifetime chance to buy an entire Cotswold village with a restored and extended Grade II-listed manor house, a renovated three-bedroom former rectory, five cottages and 509 acres of good farmland, pasture and woodland, is something really quite special. 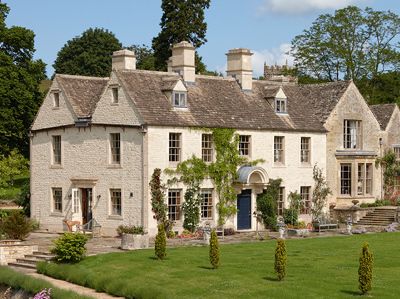 Historically owned by Lincoln College (part of Oxford University) before being bought 10 years ago by its current British owner, Little Rollright nestles discreetly in a fold of the sweeping Cotswold hills, a few miles from the Four Shires Stone near Moreton-in-Marsh that marks the historic meeting-point of Oxfordshire, Gloucestershire, Warwickshire Wordsand Worcestershire. At the heart of the estate is the tiny candlelit chapel of St Philip, built by William Blower in 1617, and, being owned by the Church, is the only building in the village not included in the sale. On the estate’s northern edge are the ancient and mysterious megalithic Rollright Stones, which possibly pre-date Stonehenge and are thought to guard a 5,000-year-old burial chamber. The village is dominated by Little Rollright’s gabled 17th-century manor farmhouse, substantially altered in the past decade by conservation specialist Robert Adam of Adam Architecture, who added a lower ground floor to provide a cinema, a playroom and a copious wine cellar, and also renovated the listed houses and farm buildings to create an impressive estate grouping. The three-storey, 11-bedroom main house has a large kitchen/family room and the main ground-floor reception rooms include the original drawing room with its beautiful bay window overlooking the garden. The estate boasts some 500 acres of farmland, of which 332 acres are under arable production, 82 acres are grassland and 62 acres are woodland- ideal for shooting, although there is no established shoot at present. The smaller fields around the manor house are down to temporary grass leys, grazed by the owner’s prized herd of pedigree longhorn cattle. A measure of the continuing strength of the prime farmland market has been the response, from farmers and non-farmers alike, to last month’s launch onto the market of the 1,398-acre Trinley estate near Andover, one of the largest farming estates to come to the market in Hampshire for several years. A guide price of ‘excess £19.3m’ was quoted by Smiths Gore (020- 7409 9490) for the Dance family’s impeccably managed mixed farming operation, based on 1,240 acres of arable land, 56 acres of pasture and some 100 acres of woodland that provide the basis of the varied and entertaining Trinley shoot. 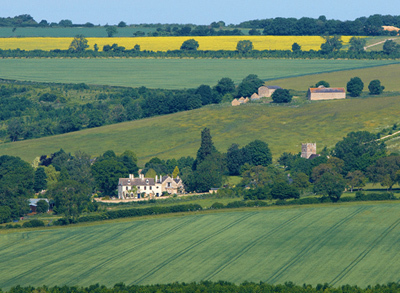 ‘The lack of land supply in Hampshire during the past five years seems to have the market salivating at the prospects offered by Trinley,’ comments selling agent Giles Wordsand worth, whose firm has set a date of tomorrow, June 12, for receipt of ‘best offers’ for the model farming estate, which has 50,000sq ft of covered buildings, more than 4,000 tons of grain storage, a self-storage business and 12 cottages. Although Trinley has no large main house, there is, obviously, the opportunity to build one, subject to planning consent. Smiths Gore’s Oxfordshire-based farms agency (01865 733300) has followed up with the launch of the historic Colbrans Farm estate, near Lewes, East Sussex, a picturesque 1,023-acre, residential and sporting estate with spectacular views of the South Downs, which comes to the market with a guide price of ‘excess £12m’. It’s being sold, either as a whole or in four lots, due to the owner’s retirement. The site of Colbrans is thought to have been inhabited since Saxon times and may take its name from Colbrond, a Viking warrior said to have been killed in a duel with the Earl of Warwick in the 900s. Colbrans was part of the larger manor of Laughton, which was vested in the 14th century in the powerful Pelham family, who owned large tracts of land in Sussex and the castles of Pevensey and Hastings. In 1356, Sir John Pelham fought with distinction at the Battle of Poitiers and helped capture the King of France. He was rewarded with the French king’s sword, belt and buckle and, thereafter, the buckle became part of the Pelham coat of arms, featuring on many buildings (and even the sheep) on Pelham estates in Sussex. The main estate house was nearby at Laughton Tower-all that now remains of a much larger building. The manor remained in Pelham family hands for some 600 years, until the farm, then about 500 acres and let, was sold for about £9,000 in 1927. Colbrans House is a fine, late- Georgian manor farmhouse, listed Grade II, which dates from about 1824, and has three reception rooms, a kitchen/breakfast room, eight bedrooms and four bathrooms. It comes with two pairs of semi-detached cottages and a pleasant four-bedroom secondary farmhouse, Chambers Court, also listed Grade II, and presumably named after Sir Hugh de la Chambre, who owned the estate in the 13th century. Manor of Laughton, which is being offered separately. 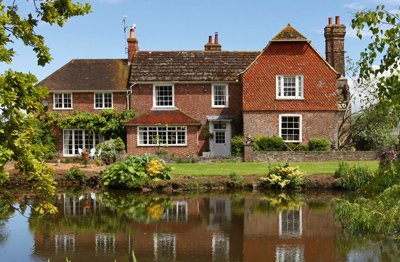 The same agents are handling the disposal of the smaller, but no less delightful Gratwicke Farm at Cowfold, West Sussex, which is being sold for the first time in 30 years, again due to the owner’s retirement. The scenic 254-acre holding is being offered as a whole at a guide price of £3.9m, or in three lots; also available is an additional 45 acres, currently let on an assignable farm tenancy. At the heart of the estate is the pleasantly rambling Gratwicke Farm House, listed Grade II, which dates from the 1500s with 18th- and 19th century additions, and has seven bedrooms, two reception rooms, a study, a kitchen, attics and a cellar. It stands on high ground overlooking its own land towards the South Downs in the distance. Original features include fine timbers, a 15ft inglenook fireplace and a 16th-century chimneystack. It comes with a three-bedroom lodge cottage, extensive farm buildings and stabling.